Take a deep breath. Now, brace yourself for an experience that simultaneously defies and defines all the rules of the suspense genre. But hang on. How do I review this film without giving away the plot? Andhadhun is a spoiler’s paradise. There are so many twists in the plot that a more apt title according to me, would be Aao Twist Karen (for the record, the directors confirms this was a title seriously considered). And none of these twists and turns in this sharply curved thriller is a redherring. Everything and nothing makes sense in the morally unhinged world of Sriram Raghavan. People kill, maim, hoodwink, and betray the unususpecting at the drop of a hat. The film’s hero is a blind pianist, played with eclectic aplomb by Ayushmann Khurrana. Though mercifully he remains a pianist right until the bitter battered finale when nemesis is no longer willing to stay huddled in a corner. Raghavan’s talented team of co-writers (Arijit Biswas, Pooja Ladha Surti, Yogesh Chanderkar) take the kinetic plot all over the pace without losing its bearings. Just when we are getting to know the blind pianist, the narrative introduces a smouldering femme fatale, played by the resplendent Tabu, and her aging superstar-husband whom she may not want around for too long. Before I move on—as this film constantly forces you to do—I must take a break to say that casting the 1970s’ star Anil Dhawan as the fading superstar Pramod Kumar is a masterstroke. Dhawan has the hits and his character is as emptied of heft as an artiste as Dhawan was in his heydays. Raghavan loves to adorn his thrillers with retro embellishments. In Johnny Gaddar he some used the 1970s’ hits with telling impact. 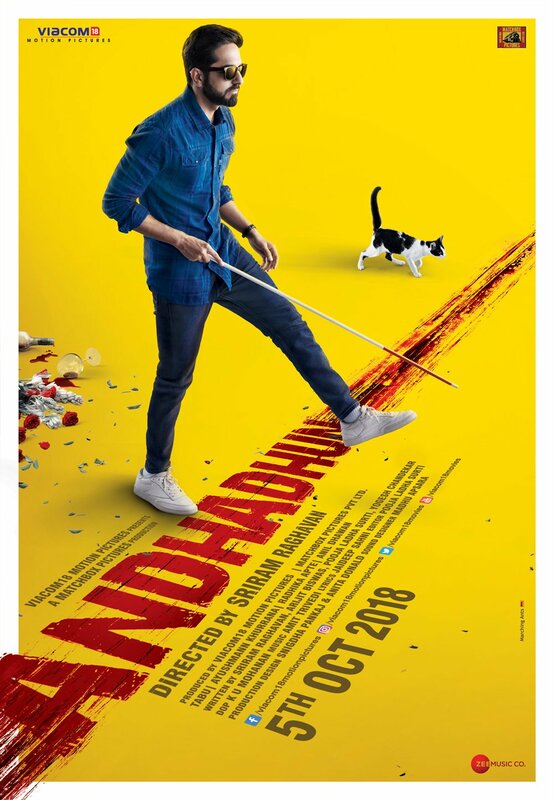 This time in AndhaDhun Raghavan pulls out all the stops to envelope Anil Dhawan’s character with a swirling retro-heat. Songs, scenes from Anil Dhawan’s starrers swish by in tantalizing glimpses. And to hear Ayushmann sing and play ‘Ghuzar jaye din’ from the Anil Dhawan starrer Annadata, is a joy that the grey-black characters cannot thwart. This cannibalization of cinema history with fiction is in keeping with the narrative’s mood of yoking personal details from the characters’ lives with flights of fictional fantasy. We know the pianist-hero is not what he seems. But just how far his deception goes comes a shocker. No one except the surprisingly insipid Ms Apte is to be trusted. There is a game-plan behind the seeming placidity that every character demonstrates. The remarkable fusion of colours and moods lends a blended brilliance to the frames. In one sequence the blind pianist plays on as a dead body appears in the frame. Red wine and blood mingle on the floor. Elsewhere an old woman is hurled to her death from a skyscraper. As investigations go on, an abandoned schoolbag lies on the floor. Probably some kid who was hastily bundled back home after the crime. We never know what may happen next in this saga of the raga and retribution, told with a verve and velocity that the suspense genre has never experienced before in Hindi cinema. So if you’ve been wondering why suspense films in Indian cinema seem so amateurish think no more. Andhadhun is everything that a murder mystery should be. Filled with morally reprehensible characters including an absolutely debauched cop (Manav Vij, dazzlingly slimy) it doesn’t try to impress us with the right moral values. God is on leave. And goodness is on a hunger strike in this film about greed, passion and nemesis. 16 queries in 1.284 seconds.